Obituary for Mark Tulele Radrodro | Goldsboro-Fabry Funeral Home, Inc.
Mark Tulele Radrodro, age 29 of Uniontown passed away unexpectedly of natural causes at work on Saturday, March 23, 2019. He was born on December 31, 1989 in Suva, Fiji Islands, a son of Isimeli Radrodro and Mele Atago Radrodro. Mark was preceded in death by his maternal grandfather, Jale Ataogo; paternal grandfather, Peniasi Vulawala; paternal grandmother, Adi Salote Lewatu Vulawalu. 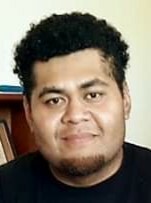 In addition to his parents he is survived by his loving wife, Makosoi Wong Radrodro; children: Siale and Sera Hosannna Radrodro; step brother, Josue Dutton; step sister, Sophie Radrodro; sisters in law, Tina (Waisea) Puamau and Sera (Viliame) Boladau; brother in law, Macin (Inise) Wong. Mark’s family will receive friends in the Goldsboro-Fabry Funeral Home, Inc., 21 E. Church Street, Fairchance, PA from 4-8 p.m. on Thursday, March 28, 2019. Interment will follow in Santa Rosa Memorial Park, Santo Rosa, CA.